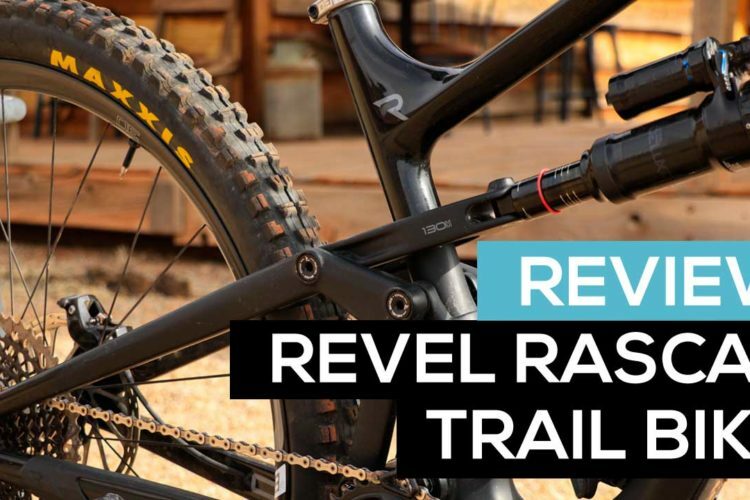 The 2019 BMC Speedfox trail bike drops $1,000 off the price for the top-of-the-line model and tweaks geometry just a touch, while keeping all of the best features in tact. 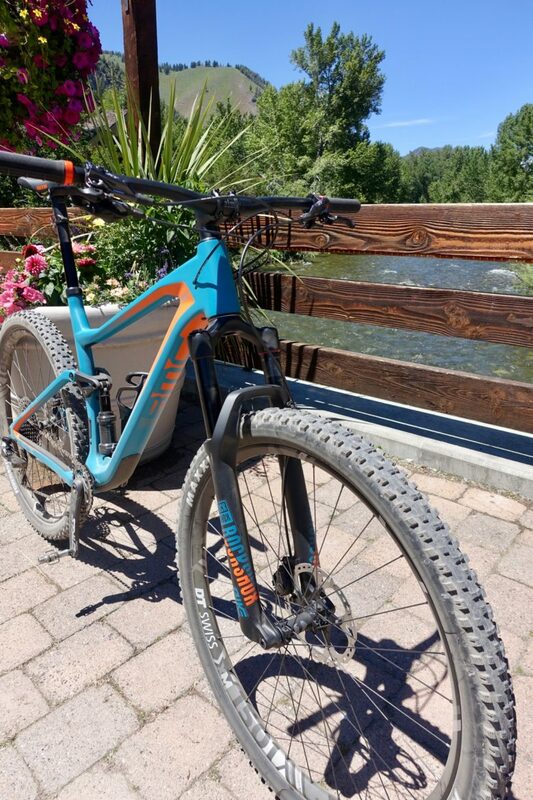 I had a chance to test ride the updated Speedfox in Sun Valley, Idaho last month, and here’s what I learned. The 2019 BMC Speedfox 01 features a premium carbon frame, weighing as little as 2,330g with the shock. 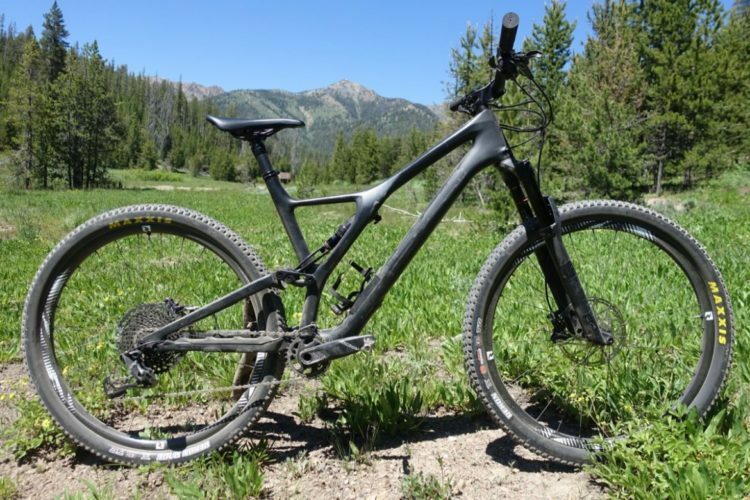 Like other mountain bike brands, BMC offers two grades of carbon fiber, with “standard” carbon specced on their lower-priced “02” carbon build. The premium carbon in the 01 build I tested essentially weighs less, while offering similar strength and durability. It appears BMC dropped the 27.5″ wheel spec for small and medium frames for 2019, going with what they’re calling the Big Wheel Concept (BWC). 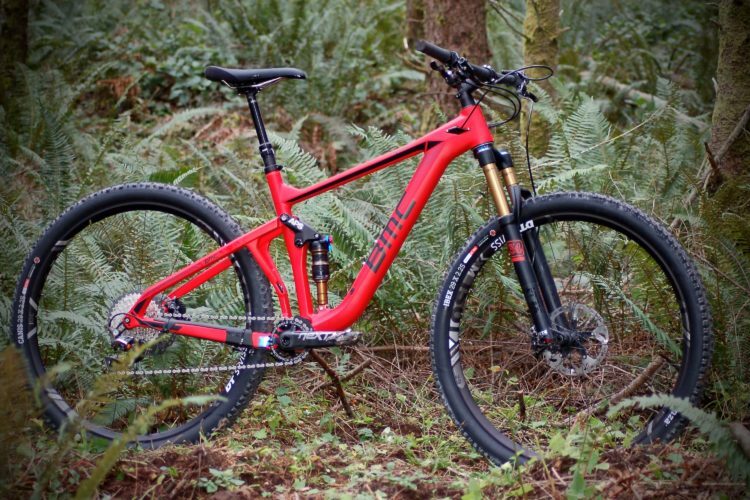 BMC is making a big commitment to 29er wheels overall, and this shift in the Speedfox spec shows that dedication. 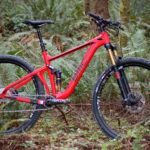 BMC updated the Speedfox for 2019 with a slightly steeper head tube angle — 68.25° — which is three quarters of a degree steeper than the previous version. 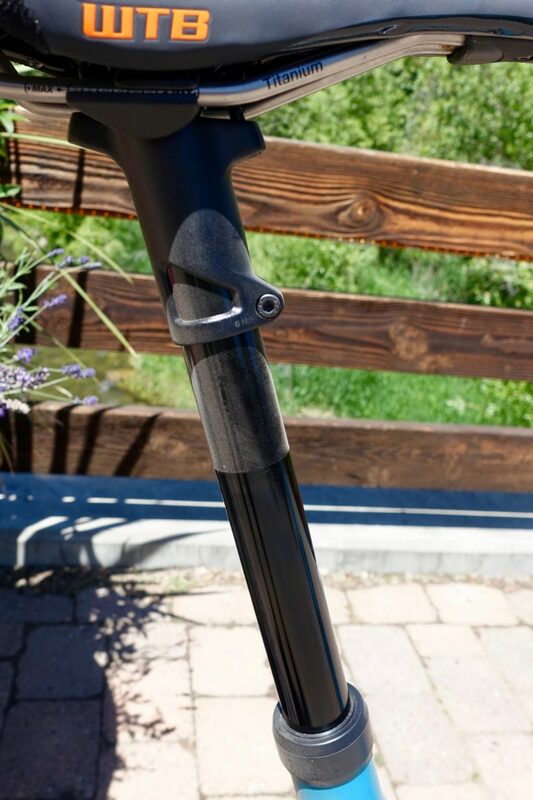 This steeper head tube angle is generally in line with the average for trail bikes, perhaps indicating that the older version was just a bit too slack for some buyers. It’s interesting to note that BMC reports the head tube angle to the hundredth of a degree, clearly indicating a high level of precision. 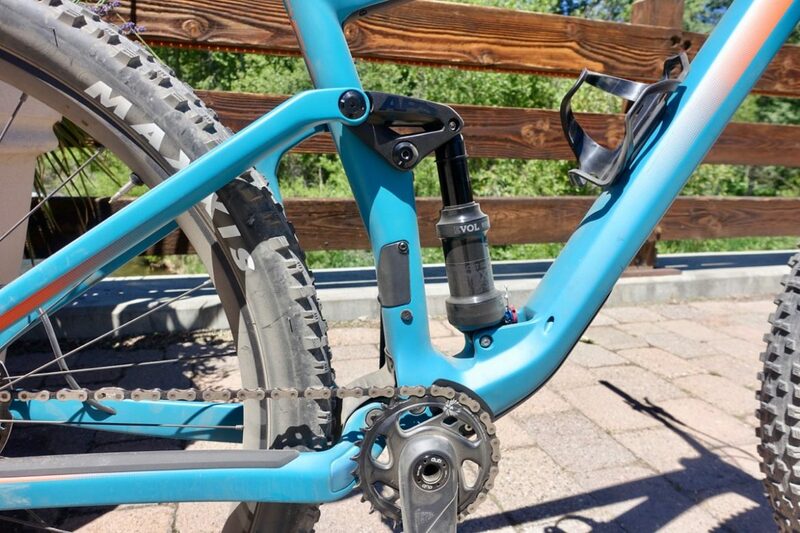 Speaking of precise angles, BMC sets the seat tube angle at 73.75° for the 2019 Speedfox, which is half a degree steeper than the previous Speedfox. Again, this points to an effort to improve the bike’s climbing ability. Reach stayed the same at 450mm for the size large frame, while the chain stays grew 5mm to 450mm. 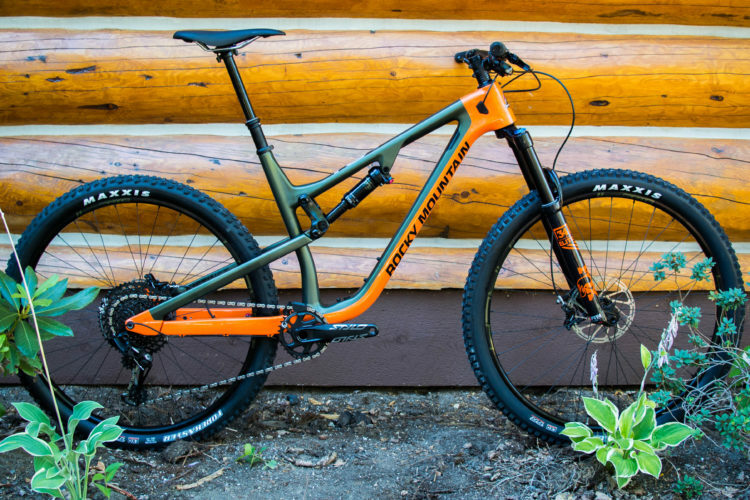 BMC uses a four-bar linkage design called Advanced Pivot System (APS), and offers 120mm of rear suspension travel on the Speedfox. There’s a mud flap in the rear to keep crud out of the lower pivot, which might seem a little dorky but IMO it should come in handy, especially when riding in muddy conditions. Clearing sticks and grit out of the pinch point on my own bike is a real chore, not to mention a real wear-and-tear issue for the linkage and bearings. The Speedfox features a Boost rear end (naturally), but only offers clearance for tires up to 2.35″ wide. This means a 27.5+ option probably isn’t in the cards, and limits tire selection for those looking at 2.5″ 29er tires. 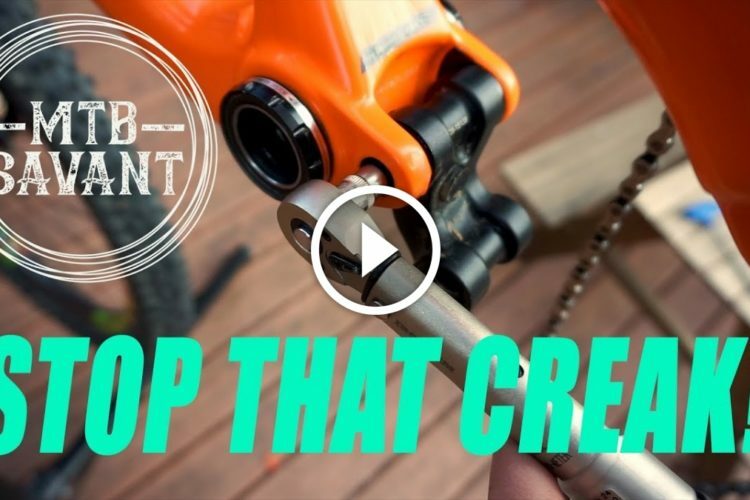 This seems to be a tradeoff intended to allow buyers to run an optional front derailleur (FD) on the Speedfox. Many brands are opting for bigger tire clearance over the ability to run a FD these days, though for a more race-oriented bike like the Speedfox, wide tires aren’t a big priority anyway. 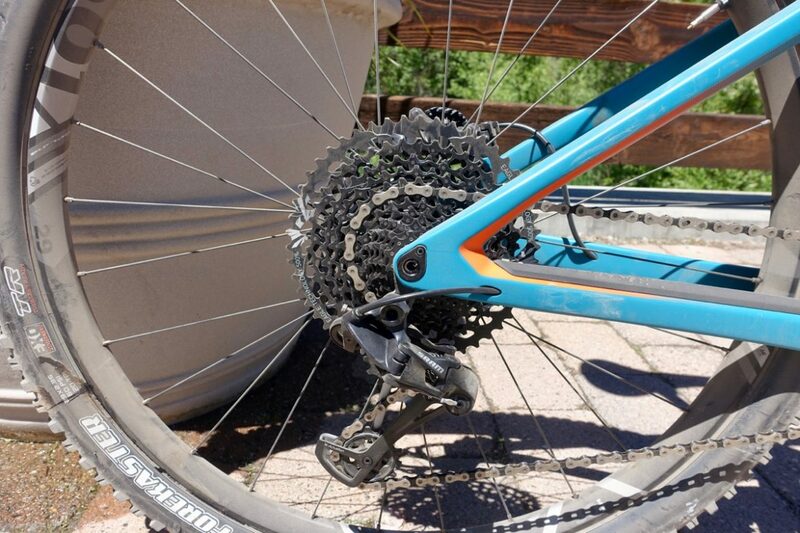 As I mentioned at the top of the review, the 2019 Speedfox 01 is a thousand dollars cheaper than the previous version, in large part thanks to changes to the drivetrain. The build I tested features a mostly GX Eagle drivetrain, though BMC still manages to squeeze in a nice carbon Stylo crank set. Up front, the Speedfox 01 features a 130mm Rockshox Pike RC fork while the rear shock is Fox Performance EVOL. BMC specs Shimano XT hydraulic disc brakes with 180mm rotors front and rear. The wheels are DT Swiss XM 1501s with a 30mm internal rim width and the tires are Maxxis Forecaster 29×2.35″ tires. Look closely and you can see the internally-routed Trailsync cable connected to the shock mode switch. 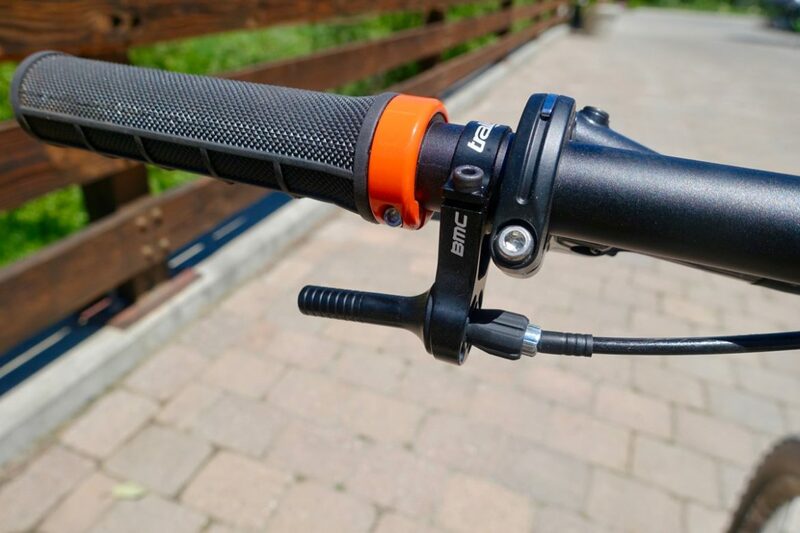 BMC offers a unique feature on the Speedfox called Trailsync which couples the dropper post action with the shock mode controller. Essentially when the rider drops the post, the shock goes into “descend” mode. Raising the post puts the shock into climb mode. Everything is internally routed in series. That is, the lever at the bar is attached to the post, which is then attached to the shock. Because the dropper post is connected to the shock via internal cable, the post position within the frame is basically fixed. 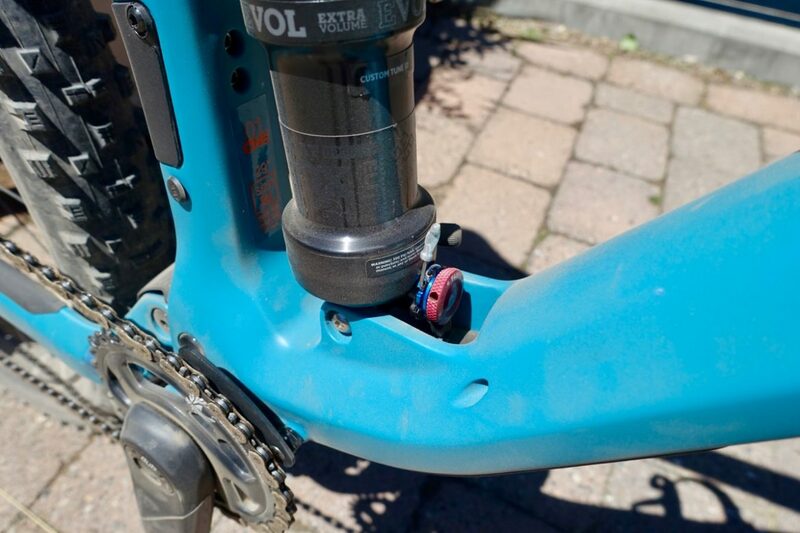 Seat height can be adjusted at the top of the post, offering a little wiggle room, but big changes require cutting the top of the seat post to height. The post cannot be moved up and down within the frame. Instead, the top of the post is cut to fit the rider and offers limited adjustability. 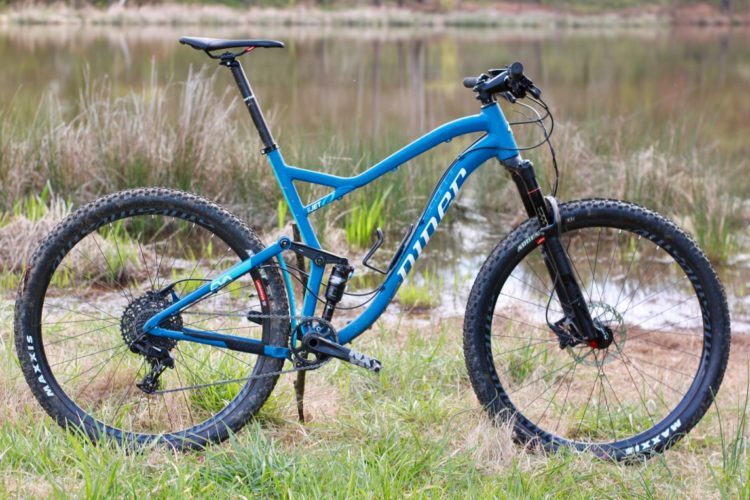 The amount of travel the BMC Trailsync dropper post offers is based on the frame size; size small frames get 80mm of drop, size medium gets 100mm, and large and XL frames get 120mm. 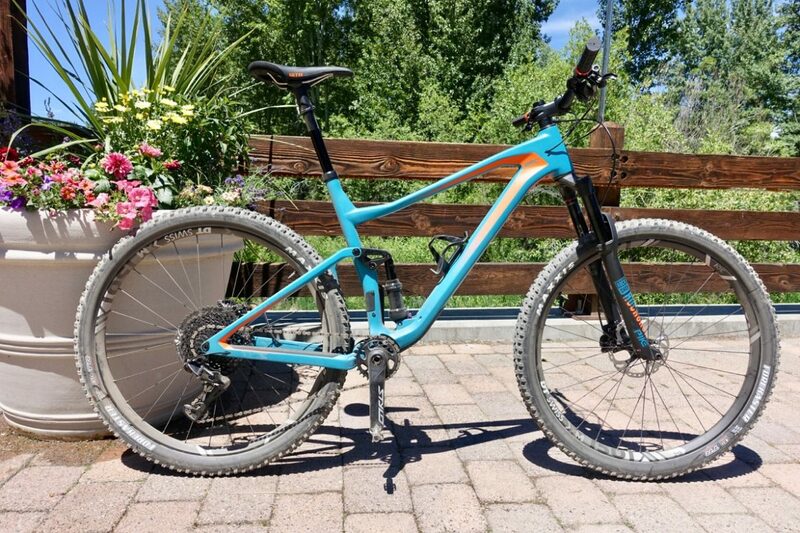 This was my first time riding the Speedfox, and though I can’t compare the 2019 bike to the previous version, I did come into the ride assuming the bike would be a little uncomfortable, and stiff, and racy. But after two short rides, I found the Speedfox 01 to be comfortable, fun, and more than capable on both the climbs and the descents. Going uphill, the Speedfox feels great. 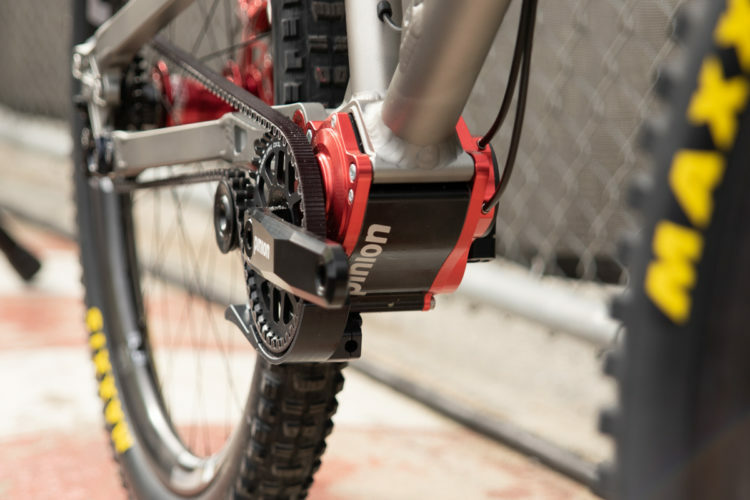 It’s lightweight, snappy, and pedals really efficiently. None of this really surprised me given the specs and my admittedly limited knowledge of the Speedfox. Still, there’s a lot to this Trailsync thing. See, I’m the guy who forgets to flip his shock mode for climbing and descending. Based on my conversations with others, I’m not the only one. I can’t even count the number of times a demo truck driver has suggested I would be fine just keeping the shock in descend mode for an entire test ride. With modern suspension designs, this is mostly true, especially compared to older shocks and frames. But still, climb mode exists for a reason. I have, however, become very adept at using a dropper post, especially given the up-and-down nature of my home trails. I never forget to drop my dropper post on a descent, so tying the post to the shock makes perfect sense to me personally. Of course there is an argument that riders don’t always want the shock to be in climb mode when the post is up, or vice versa. A perfect example is a technical, chunky climb where an active shock keeps the tire firmly planted better than a shock placed in “climb” mode. 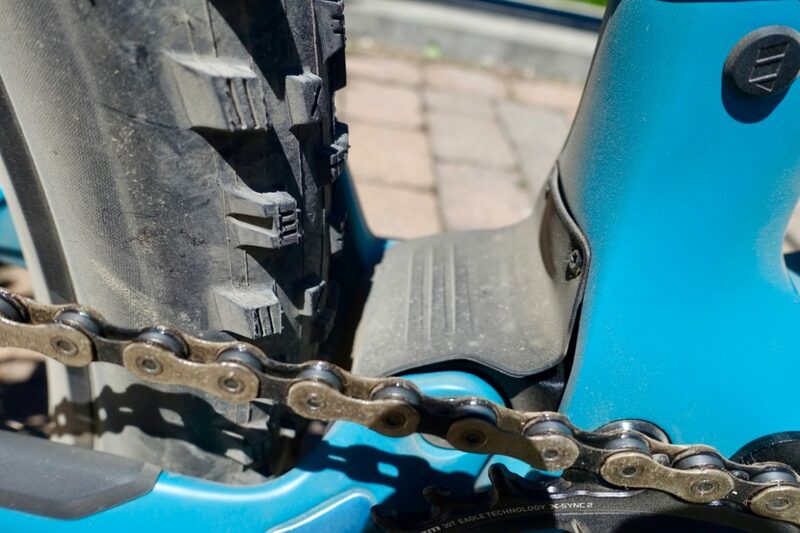 There are certainly other exceptions like this, but most riders and most conditions dictate that the post and shock work well when synced together. I don’t like this lever one bit. Hopefully it can be swapped out for a traditional lever. My one gripe with the whole setup, however, is the Trailsync remote itself. It’s a weird rocker-style remote that can be pushed or pulled in any direction, which makes it super versatile. But I found it difficult to know when I’d pushed far enough to engage the dropper post since there wasn’t a stop or click point. The lever also seemed to require more force than a traditional dropper post lever which I found slightly annoying. Descending the trails at the Galena Lodge trail system, I found the BMC Speedfox performed above its pay grade, lending confidence through small jumps and sweeping berms. To be clear, the Speedfox is a light-duty trail bike, but if I closed my eyes I could fool myself into thinking it was closer to a mid-range trail bike. The 130mm Pike fork rounds up the feel of the relatively short 120mm of travel in the rear. I also had a chance to ride the Speedfox on a couple of the downhill trails at Bald Mountain, and honestly the first half of the ride was a bit harrowing. 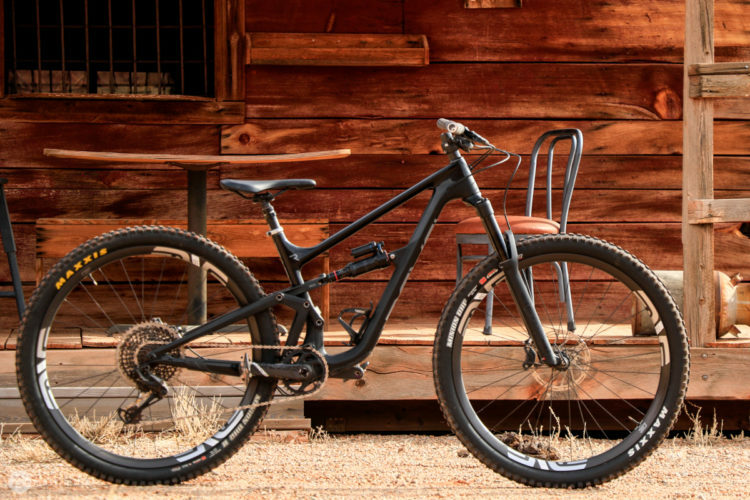 Not that this should be a surprise; the Speedfox is a trail bike, not a downhill bike. However, after letting a significant amount of pressure out of the tires, I felt confident-ish enough to tackle the new double-black diamond Pale Rider trail on the Speedfox. While the wide open, steep, and loose trails on the upper portion of the mountain felt a little scary on the Speedfox, the low-speed, tight, and slightly more technical lower trails like Pale Rider turned out to be a decent match for the bike. While there’s still a good bit of 2018 left to go, I have to say the BMC Speedfox 01 is my favorite bike I’ve tested this year. The bike is lightweight and responsive, and getting the most out of the suspension doesn’t require a whole lot of thought. Outside of the downhill park, this is a bike that can tackle pretty much anything I ride throughout the year, which makes it really versatile choice. The BMC Speedfox 01 retails for $6,499, down from $7,499 for last year’s model. Entry-level aluminum builds start at $2,199. At 16 kilos it’s way to heavy. I didn’t get a chance to weigh my test bike, but I’m certain it weighed less than that, closer to 14kg. What’s the point of a review if you don’t weigh the bike? You think someone paying over $6000 for a bike doesn’t care what the weight is?